There are no behind-the-scenes shenanigans, no interviews, no audience. Just Pamela Williams, recorded live in the studio at Toronto’s Harbourfront Centre Theatre. That’s plenty, as Wil-liams has proved she’s not only one of the most adept female saxophonists in the smooth-jazz genre, but one of the most adept, period. Surrounded by her band-keyboardist Alphonso McDuffie, guitarist Robert Cunningham, drummer Myron Gardner and bassist Jeffrey Johnson-Williams is obviously having a good time in front of the camera, even if a crowd’s not present. 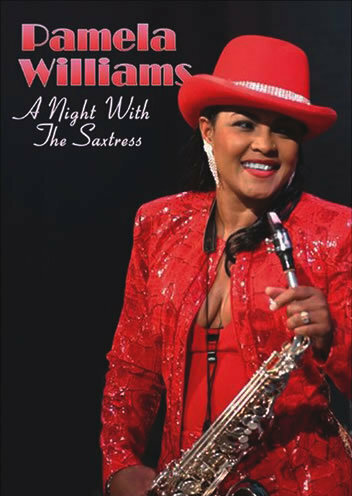 Williams, whose nickname is “the Sax-tress,” dresses for the occasion in skintight red pants, cleavage-baring top and red top hat. She later changes into an equally skintight white pantsuit. The camerawork is adeptly handled by director Daniel K. Berman. The stage lighting is superb, as is the sound, which can be set to PCM stereo and 5.1 Surround Sound mixes.